I’m passionate about living in a chic and stylish home, but also want to make sure it functions for my family. With two young children that I absolutely adore, I have a particular desire to live in a beautiful space with my family. Most of us reserve the living room for entertaining family and friends, and it is also the space we tend to spend the most money when it comes to design. Because of the investment in these rooms, children are shooed to the basement or another area in the home where toys, shoes, backpacks and spilled juice boxes live together happily. There are two separate spaces and herein lies the problem for families that want to hang out together. It takes a special talent to combine elegance and function in a room that doesn’t leave you worrying about stains from little fingers and hands and flying Nerf darts. 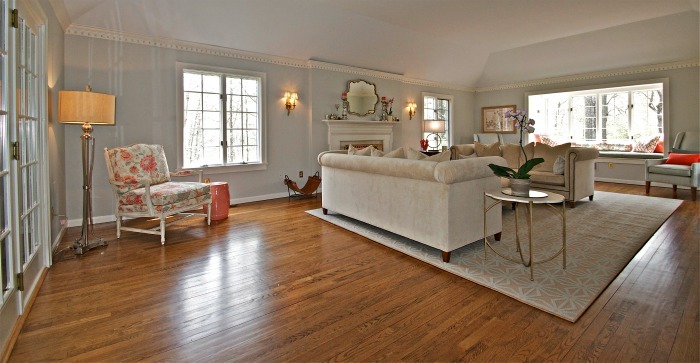 Case in point, this serene and tasteful family living room by Kelly Sohigian. 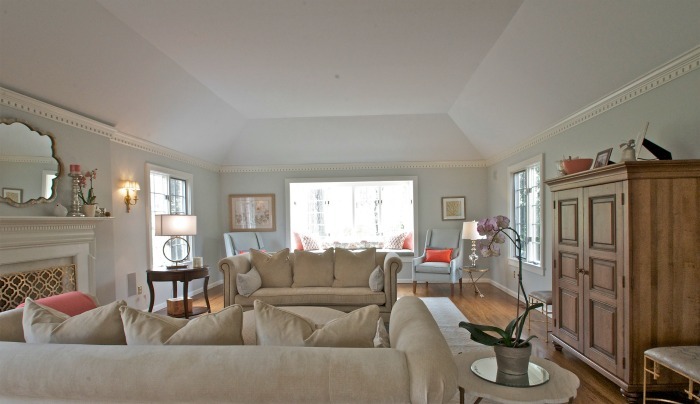 The couple has three children and wanted this one large room to have a sophisticated look, but still be kid-friendly. This inviting living room is filled with chic details and everything was stain-guarded for protection so Mom could relax. The stage is set by two matching camel back style sofas in a rich velvet stria with nail head detail. 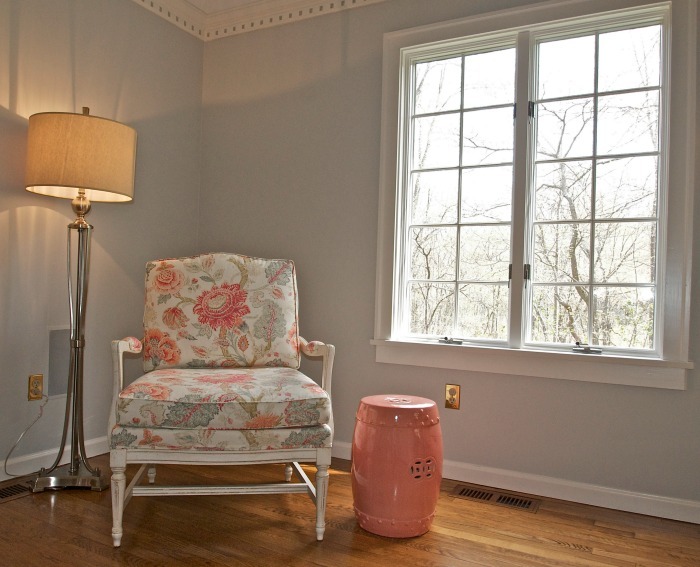 Benjamin Moore’s Gray Owl was used on the walls and impart a soft grey/blue effect. 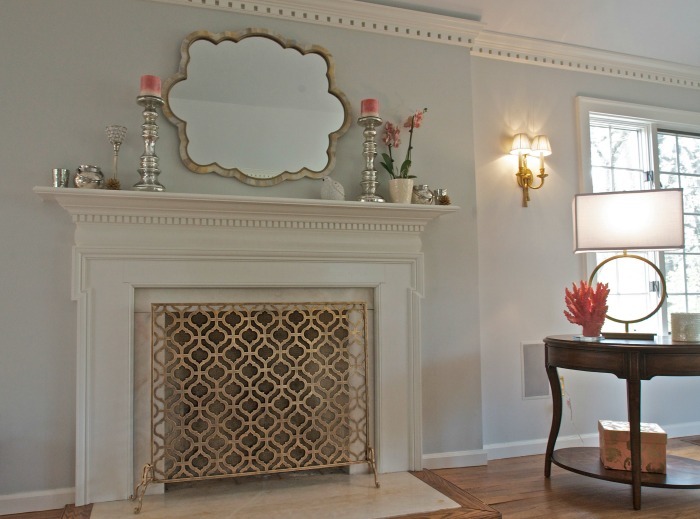 You’ll notice that there are several areas with gold-tone accents that illuminate the fireplace screen. Fun, zebra print fabric was used for the pillows on the sofa. I love that this room is cozy, yet it exudes elegance. 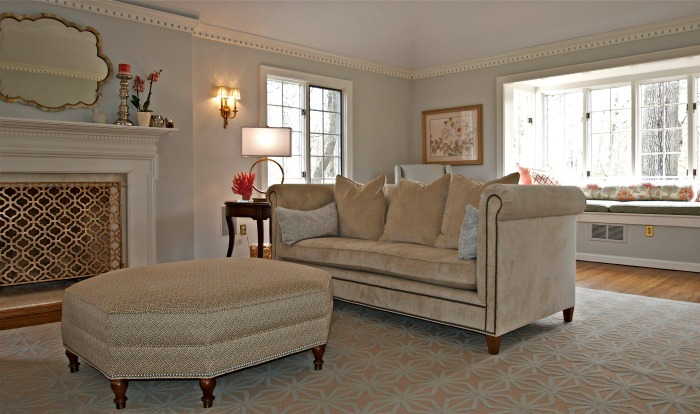 The octagonal ottoman was done in classic Greek key pattern to complement the shape of the pattern on the fireplace screen. 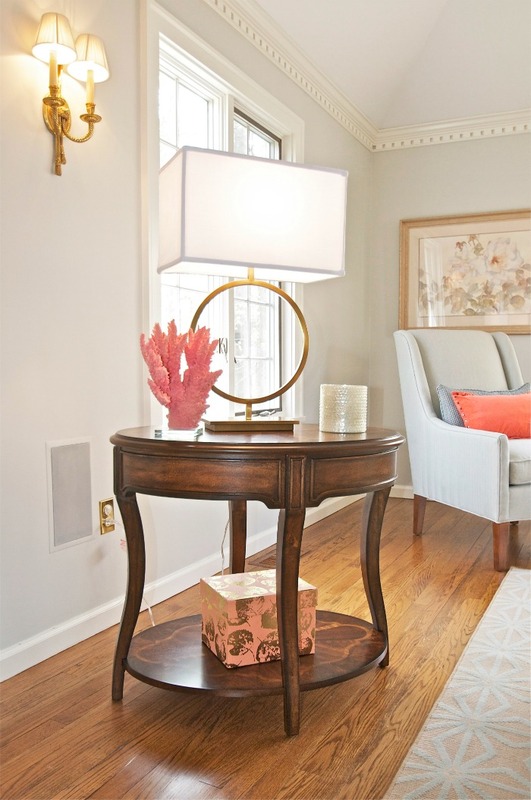 I love the pops of coral for color, it is such a great complement to the light blue tones in the chair and rug. The chair was re-upholstered in the floral pattern with color, cream and blue/grey that tied everything together. The chairs were done in a subtle blue herringbone, the rug is neutral with a raised blue pattern. More information about Kelly. 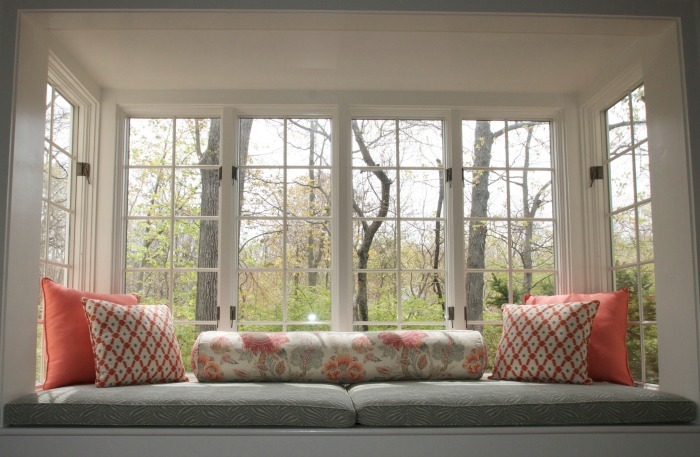 Kelly Sohigian is the Founder of Kelly Designs, a Connecticut-based interior design firm that offers a large array of services and has an on-line store that sells fabulous pillow covers, throws and window treatments. You can see much more of Kelly Sohigian’s design portfolio here and I already have plans to feature her again soon! When I asked her about her approach to design, she told me that she tries really hard to understand the function, flow and personalities of the families she works with. She considers all their needs and helps them create a space that they love, that reflects them and not her. Kelly loves to layer textures, styles, and colors and mixes old with new. She makes it a point to always sprinkle a bit of the family’s personality throughout the project. To her, the hallmark of a good design project is when she’s done the client feels that the space they created is home to them, they love being there and are proud of it.